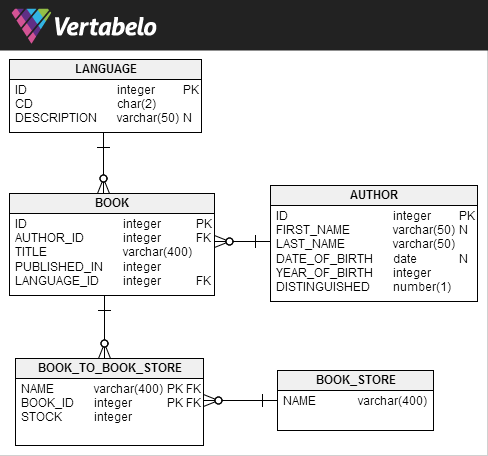 Vertabelo – Java, SQL and jOOQ. The most important aspect of such an ERD tool, however, is its import / export functionality. Not only can an existing schema be reverse-engineered, but you can also export it in SQL or XML format. This is great news for early adopters of the upcoming jOOQ 3.5, which will finally support importing file-based schema definitions, e.g. using an XML representation of your INFORMATION_SCHEMA. A full export file can be seen here. select="/DatabaseModel/Tables/Table/Properties/Property[Name = 'Schema'][generate-id() = generate-id(key('schema', .))]" The full XSL file can be seen here. This obviously works with other ERD tools than Vertabelo as well. It should be just as easy to write your own XSL file for your own tool. All you need to do is generate valid XML according to the new http://www.jooq.org/xsd/jooq-meta-3.5.0.xsd schema. See the pom.xml file here, for details, or download the full example project from GitHub.